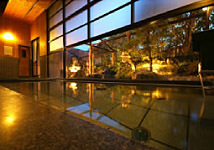 Onishiya Suishoen in Kinosaki Onsen is a Japanese modern style ryokan with hot springs. Free Wi-Fi. Pick-up and rental bicycles with no extra charges. Van shuttle offered in every evening, to the main area of Kinosaki town. Help yourself for a cup of coffee or Japanese tea in the lounge at any time. New Japanese modern style inn, which has its hallway covered with tatami mats. A little murmuring stream flows through the courtyard, and it is staged with small bonfires to produce a fantastic atmosphere of Noh performance. It creates extraordinary and profoundly elegant time for you. As for dinner, you can enjoy the authentic Japanese meal of dainty and refined dishes, each served individually using local delicacies and seasonal ingredients. At dusk, we burn small bonfires. They light up the figure of a Noh protagonist on the stage made of stone. It spreads the atmosphere of subtle and elegant beauty in the surrounding. In the lobby, there are free self-service coffee and tea, free Wi-Fi spot. You can enjoy the time of relaxation. In our inn we offer you a rental yukatas for 1,000 yen in additon to a free normal yukata. 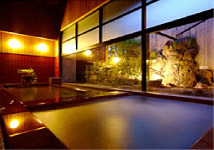 You can take delight in going around to the outer spas as well as taking a stroll wearing yukatas of various patterns. The size is one size only which fits for everyone. service through out the hotel for our guests. There is also a small exhibition of photographs of white storks, kounotori designated for special protection, as well as a small lounge. In our inn, we use the white storks as a Trademark, bird of happiness, literally kounotori (kou-happiness, no-of, tori-bird) as the symbol of the inn. Banquet Hall: Matsuba ( tatami room, size of 90 tatamis which is equivalent to 149㎡. Thus it can be separated to two rooms of 50 and 40 tatamis. Once upon a time, a white stork with an injured leg healed its wound in the hot spring of Kinosaki. Knowing such legend through a traveler's book, mind is uplifted somehow, and you feel like taking a bath as soon as possible The advantage of our inn is to be able to take an inner bath whenever you like, which can make your travel more pleasant. In the spa, you can view the bright and spacious inner garden, and smell the fragrance of unvarnished wood. You can come to fit with the yukata at the time of second bath even though you might have felt the yukata awkward on your skin initially. 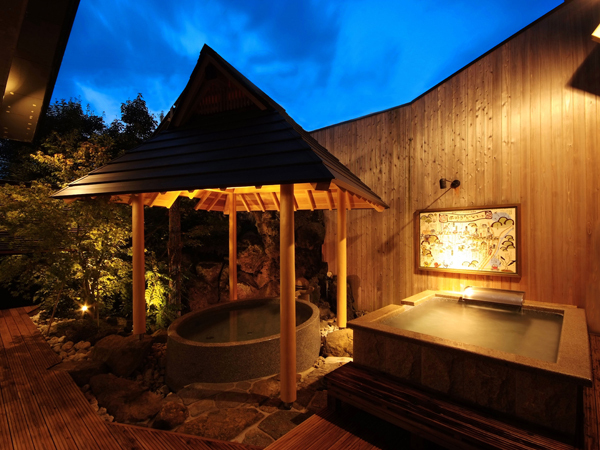 The fresh green of spring, deep green of summer, colored leaves of autumn, snowscape of winter…these seasonal views of a gorgeous Japanese atmosphere in the open-air baths will capture your mind, especially those of yours who love hot springs. Use the sauna, then go to an open-air bath to cool down the warm body. 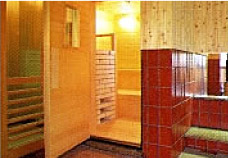 Then back to the sauna again …the benefit of the sauna is to be able to enjoy it in various ways. It will surely refresh your body and mind. How about foot massage after the spa? We also have black soybean tea, cold water, coffee, etc. prepared for you. You can drink them all for free. Sodium and calcium chloride high hot spring. Neuralgia, muscular pain (myalgia), bruise (contusion), chronic digestive disorder, piles (hemorrhoids), recovery from fatigue, etc. How to use the baths.